The 230-278 Barometric Pressure Transducer is designed for use in environmental applications that require excellent accuracy, fast dynamic response, and long-term stability and reliability. To withstand the environmental extremes typically found in Automated Weather Station (AWS) and environmental monitoring applications, the 230-278 housing is constructed of stainless steel and polyester. A removable 5-pin terminal strip module is provided for easy connection to data logger and signal connections, and a 1/8" barbed fitting is used for pressure connection. The transducer's footprint (3.6" x 2.4" x 1.0") makes it ideal for use as a new or drop-in replacement to existing configurations. The 230-278 is operable in temperatures from -40°F to +140°F (-40°C to +60°C). This unit consumes low levels of power (3mA nominal) while in operation. Its sleep mode feature reduces power consumption to 1 µA, and provides instant startup for applications where pressure readings must be taken quickly. 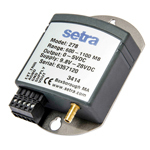 The 230-278 utilizes the Setraceram™ capacitive sensor and proprietary custom IC analog circuit. This fundamentally simple design and thermally stable glass fused ceramic sensing capsule is coupled with a sophisticated capacitance charge-balance IC circuit where accurate signal conditioning and environmental compensation is performed. The Setraceram™ sensor provides excellent thermal expansion coefficient and low mechanical hysteresis, which contributes to the long-term stability of the instrument. Dimensions: 3.6" x 2.4" x 1.0"